Whether you burn your toast or not, toasters accumulate crumbs, which can burn, smoke and even catch fire, if left to build up for too long. So, even though you can’t see the crumbs inside the toaster, they are definitely there and need to be cleaned out. Unplug the toaster from the wall. Holding the toaster over the sink (so the crumbs don’t go everywhere), remove the crumb tray from the toaster. 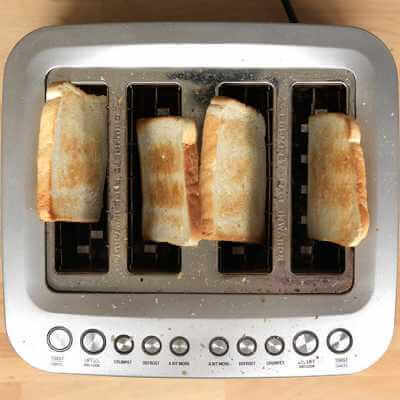 If your toaster doesn’t have a crumb tray, turn your toaster upside down and give it a good shake until the crumbs stop falling out. If the tray still has crumbs stuck to it, wash it in a bowl of hot soapy water and dry it well. 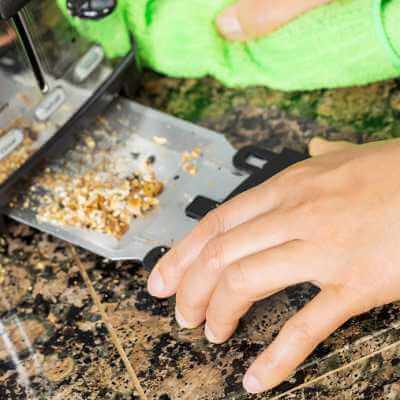 With a small pastry brush, brush into the areas that are hard to reach to get rid of any lingering crumbs. Give the outside of the toaster a wipe down using a damp cloth. Place the newly clean and crumb-free tray back into the toaster. Top tip: If you have a stainless steel toaster, dip a clean cloth in a bit of vinegar before wiping over the outside of the toaster. This will give it a nice shine!